This page features artwork that has been reproduced in limited edition prints and is for sale by the artist. These are unframed and unmatted prints. Framing and matting is available at an extra charge. We accept all major credit cards, checks and PayPal. Pictured above is the 2016-17 Idaho Ducks Unlimited State Artist of the Year print, entitled "Passing Front" Swans. Paul had the honor of winning this art competition earlier this year. It features two swans in flight and will be available in limited edition prints soon from Paul. 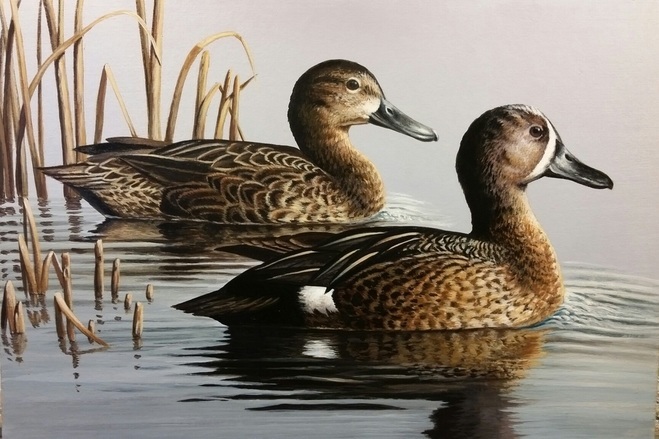 This will be the last year the Idaho Ducks Unlimited will hold this art competition and the last time this print will be offered. Prints are $60.00 each. They are signed and numbered by him in a edtion of 100 prints. Pencil Remarqued prints are $ 120.00. Color Remarqued prints are $ 160.00. Print size is 13"x19", Image size is 9 1/4" x 13". Pictured above is the 1999-00 Maryland Ducks Unlimited Sponsor Artist of the Year print entitled, "Safe Haven Woodies" . It features two Wood ducks in a cypress swamp setting. An Artist Proof edition ( prints actually proofed and checked by Paul himself) of 75 prints is available for sale and are offered at $60.00 each. These prints are very high quality and reproduced with the finest inks. Remarques (small ORIGINAL PAINTINGS OR DRAWINGS done by Paul on the print itself) are available in Pencil (drawn) on the print for an extra $60.00 ($120.00 total cost of print) and Color (Painted) on the actual print for an additional cost of $80.00 (140.00 total cost of print). The print itself is 12" x 14" and the actual image size is 7" x 9". Shipping and handling is extra. Example of color remarqued limited edition print.